April 12. 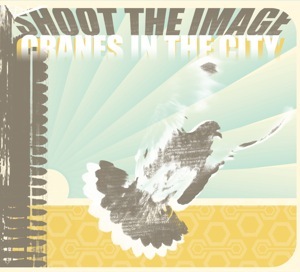 2011 | By Valerie C.
Cranes in the City produced by Boz Boorer (The Polecats, Morrissey) is the debut album of brand new Canadian band, Shoot The Image. Besides the fact that they’re our neighbors to the north and that the lead vocals are split between a female and male, not much else is known about the band. Their brand of alternarock/dreampop and occasional hint of shoegaze, reminds me of early LUSH. Nowhere is this more apparent than in he-said/she-said songs like “Fortified”. While songs like “Encore” can easily be at home on a Mates of States record. The band shines on songs where the lead vocals equally collaborate, or when the male vocals take the lead. Musically, the band is quite solid; however the lyrics department could use a little sprucing. Someone should tell the band that not all lyrics need to rhyme. The lack of info on the band is intriguing. A little mystery can be good, especially when it’s in anticipation of something great. Will Shoot The Image be something great? I guess we’ll find out soon enough.